What is Affinity Designer ? Pixel and vector graphics design in single workflow. 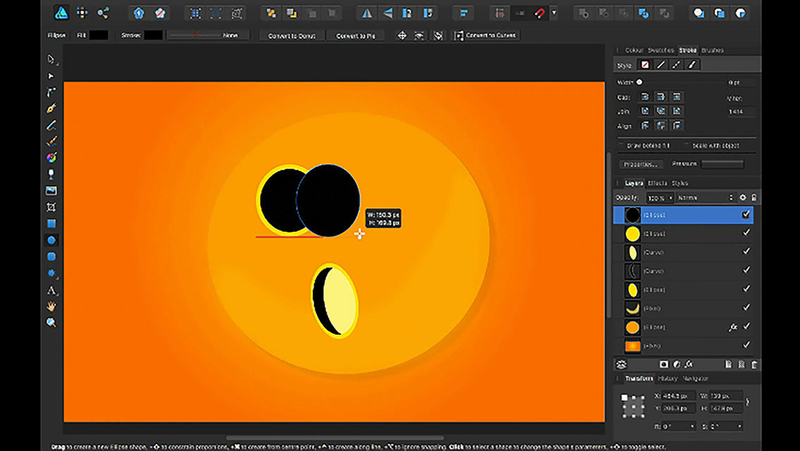 Affinity Designer is a quality vector graphics design application used for working on illustrations, UI designs and pattern designs. It has high zooming capability upto 1,000,000% that will be helpful for working on art boards. It also provides grid system due to which you can create video game graphics. In addition, it has snapping options using which objects are locked and positioned based on shapes and alignment guides. By using window stabilizer feature, you can create smooth and accurate curves. 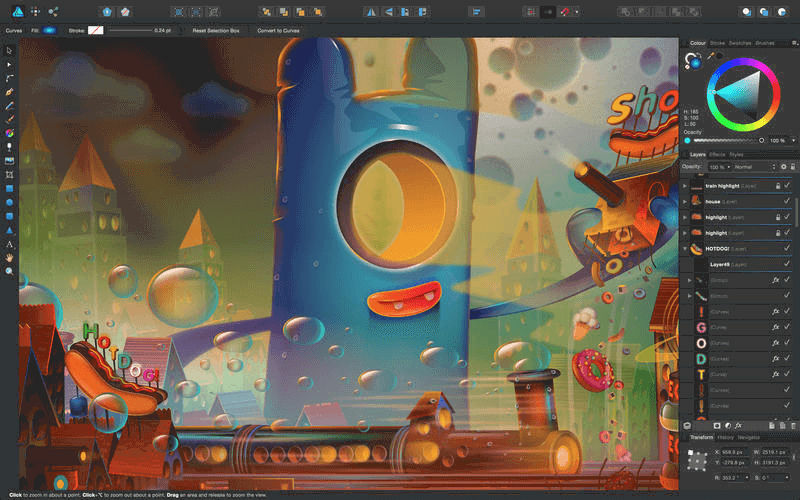 This software allows creation of vector and pixel graphics on the same workflow as it combines pixel art and vector art in a single application. How much does Affinity Designer cost ? 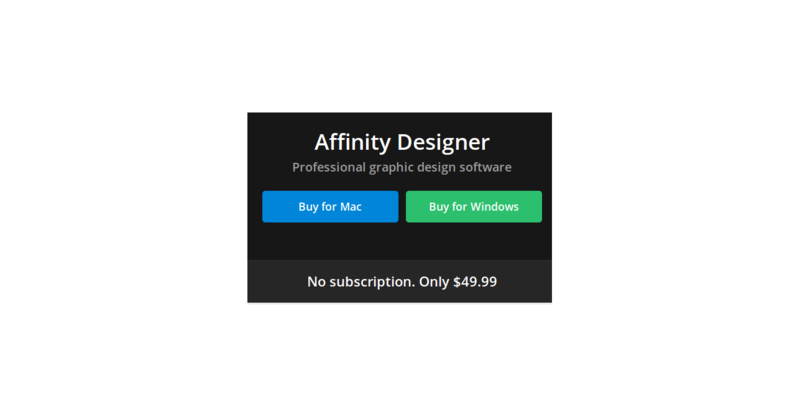 The pricing for Affinity Designer starts at $49.99. 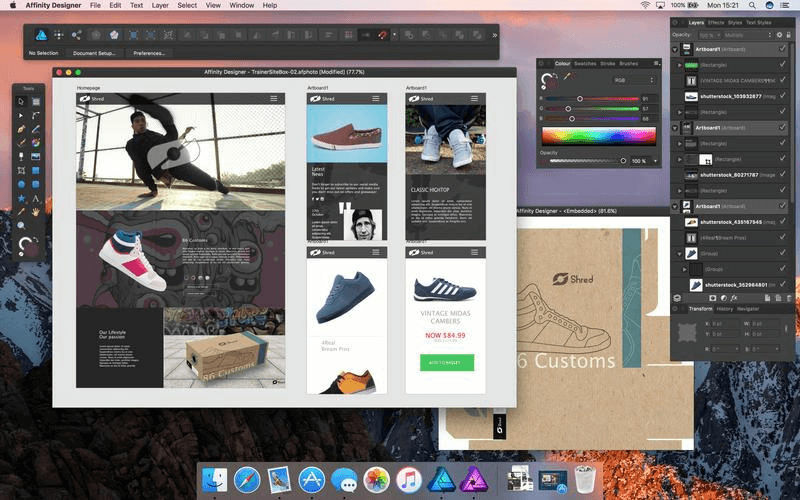 Affinity Designer has a single plan - Affinity Designer at $49.99. 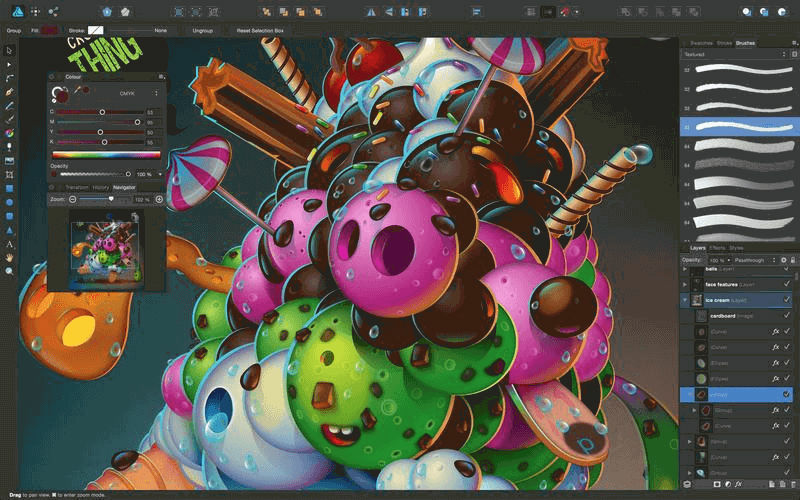 Affinity Designer can be purchased for the Windows or Mac version of the software at a one-off price of $49.99 with no subscription fees. "Great alternative to Adobe illustrator "
"Affinity Does Everything Photoshop Does...Just A Little Better! I LOVE THIS SOFTWARE!!!" Pros: Affinity Designer is easy and straightforward to use, and has a smaller front print and is lighter on system resources than alternatives like Adobe Illustrator. It's also much cheaper. All of the essential features that I use web design are still present in the software. It's improved routinely and the makers clearly care about the product. Cons: Affinity Designer isn't as full featured as Adobe Illustrator, but for just using it to create assets for web design, etc., there isn't really anything that I found missing. If you don't use a lot of Illustrator's more complicated functionality, there isn't really a big reason to not give Affinity a shot. Overall: Affinity Designer has saved me lots of money, and it also seems to make my computer happier. Where to begin? So much excellence. Pros: Unseating the great Adobe Illustrator is no easy task. Illustrator has been a stalwart of the design industry for decades. If there's a contender out there, this is it. I dare say, Affinity Designer may be better than AI. While there are some serious migration issues if you're an AI veteran, within a week or two, you will have forgotten about Illustrator. What's most impressive about AD is that it's blazing fast, super stable and has no monthly subscription requirement. It's also got a host of great features for app / software interface design, and reusable elements to speed up complex images. The brush tools are great, and the support for drawing tablets is well implemented. You'll also find support for loads of image formats and portability to Affinity's Photo product. Cons: The learning curve is a little daunting for long-time Illlustrator users. For me it had been a long time since I had to learn a new drawing application. Fortunately YouTube is already filling up with tutorial videos and how-to's. If you can get past the awkward early-stage, there's a lot to love here. But be prepared for initial frustration. Pros: If you just want to pay once and are looking for alternative for Adobe Illustrator, don't look further. Affinity Designer should be your choice. It has all you mostly need and is pretty similar to Illustrator. Cons: It's still new software and has more bugs and small errors, but they are not that often and annoying. Pros: This app is a snap to use. It's familiar enough with other illustration/vector programs that learning to get around happens quickly. The shape-building tools are the best in the industry. In my opinion, this is the number 1 app for illustration/vector drawing. Cons: That more people aren't using it. Sometimes the behavior of the layers panel confuses me. Overall: It's a pleasant, easy-to-use app that makes vector illustration a lot of fun! Alternate value photo editing software to photoshop. Pros: It is a good alternative to photoshop if you want to do quick edits like cropping, touch up, resizing etc, basically all the most common used features on photoshop. It also supports and exports files in different file types which is useful. Cons: It still lacks some groundbreaking features that adobe has. The user interface could be more friendly/prettier and sometimes the features that they do have could be overwhelming. Pros: I am occasionally in need of a design program for websites and logos. I could never justify the cost of Adobe software. Affinity Designer gives me all the power I need to do what I need to do at a fraction of the cost. Cons: Like any professional design software it is complex and can be difficult if you are not using it every day. Overall: I have used Affinity Designer for logo work for clients, website mockups, resumes, brochures, and just general drafting of ideas. It is an easy switch if you are used to Adobe products. It has all the power needed to do whatever I've needed. I consider it an equal to InDesign. "Inexpensive and does everything I need"
I like that they charge a fair, one-time fee for their software. There are some (albeit very few) tools that Affinity doesn't have that I used in other. graphic programs. I do 99% of all of my graphic design work in Affinity Designer. I use it to design both digital and print products, as well as conceptualizing new projects. Pros: Ever since Adobe switched to their monthly payments, I've been a little bitter. They're the industry standard and I couldn't find a suitable replacement. I've been very impressed by Affinity Designer, though. The cost is low, the functionality is almost the same. I haven"t been using it enough to completely say I'm ready to give up Adobe, but so far I'm amazed at hoe much this software can do. Cons: I don't have any complaints about this software, although it feels weird to be working outside of the Adobe Suite. Which graphic design software provides high zooming capability? 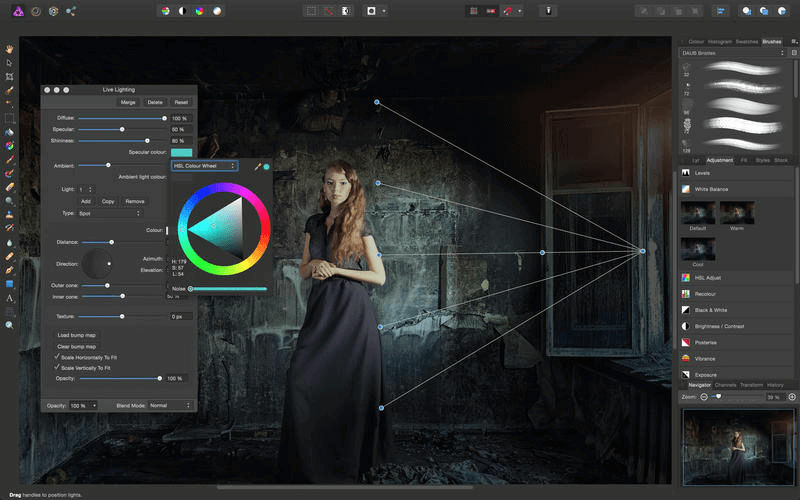 Xara Designer Pro has zooming capability up to 25,000% and Affinity Designer provides zooming capability up to 1,000,000%. Which is the most popular UX software in terms of collaboration support? 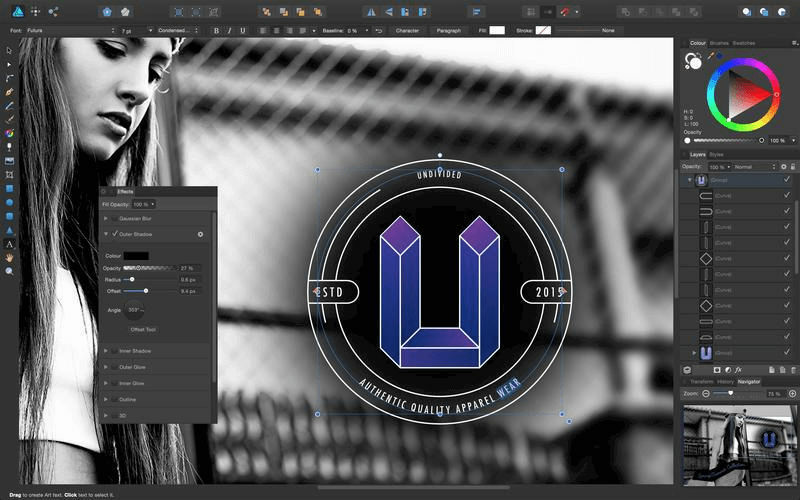 Affinity Designer is the best UX software in terms of collaboration support, as you can share projects also with those designers who are not using this software. Is there any software that supports both pixel and vector graphic designing efficiently? Yes. 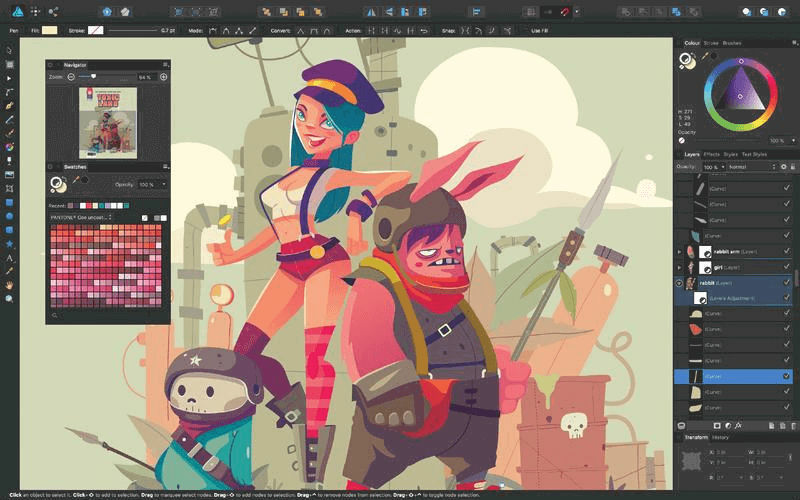 Affinity Designer supports both pixel and vector graphic designing.